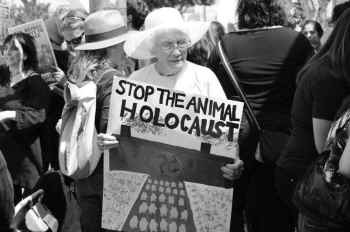 On Holocaust Remembrance Day (4/16), victims of the animal holocaust will be remembered during a funeral procession in New York City. Among the participants will be a survivor from Hungary who lost her sister and father in Nazi concentration camps and has dedicated her life to fighting atrocities committed against animals. 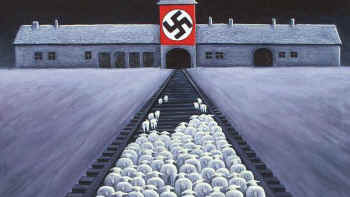 Funeral for victims of animal holocaust on Holocaust Remembrance Day. Every year in the United States, roughly 10 billion land animals and 50 billion sea animals are killed for food. 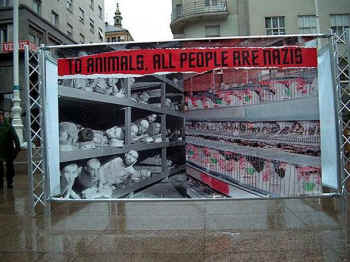 One of the founders of the modern day animal rights movement, Alex Hershaft, is a Holocaust survivor, and, like Mr. Shuchat, he’s not shy about invoking the genocide when speaking about animal factory farms and slaughterhouses. Before being smuggled out of the Warsaw Ghetto during World War II, five year old Hershaft saw Jews being beaten by Nazis in the streets. He lost most of his family during the war, but he gained empathy that helped him connect dots between crimes against humans and crimes against animals. In 1976, Dr. Hershaft founded the organization that would eventually become the Farm Animal Rights Movement (FARM). Watch Alex Hershaft: From the Warsaw Ghetto to the Fight for Animal Rights on YouTube. Funeral procession participants will gather in midtown at 7:00 p.m. and, carrying posters and banners, will travel to Times Square for a candlelight vigil. Two weeks prior to Holocaust Remembrance Day, Germany announced that it will be the first country in the world to ban live chicken shredding. Fifty percent of chickens born into the egg industry – the males – are either dropped alive into a shredding machine or are suffocated to death because they cannot lay eggs. In Germany alone, an estimate 45 million baby male chicks are killed each year.